Thank-a-Donor Day will be held April 9 from 10 a.m. to 2 p.m. at the Tate Student Center Plaza. Athens, Ga. – The University of Georgia Office of Donor Relations and Stewardship in partnership with the UGA Student Alumni Council is hosting the fourth annual Thank a Donor Day on April 9 from 10 a.m. to 2 p.m. at the Tate Student Center Plaza. The event is free and open to the UGA community. All UGA schools, departments and units are encouraged to participate. Students will have the opportunity to say thank you to UGA donors by writing personalized thank you notes, signing a large thank you card and creating video and photo messages of gratitude. The multimedia messages will be shared with donors through a video of highlights from the event. UGA campus celebrities will be part of the event with appearances by recent graduate “Big Man on Campus” Rance Nix, Miss UGA Madison Giddens, Hairy Dawg and more. 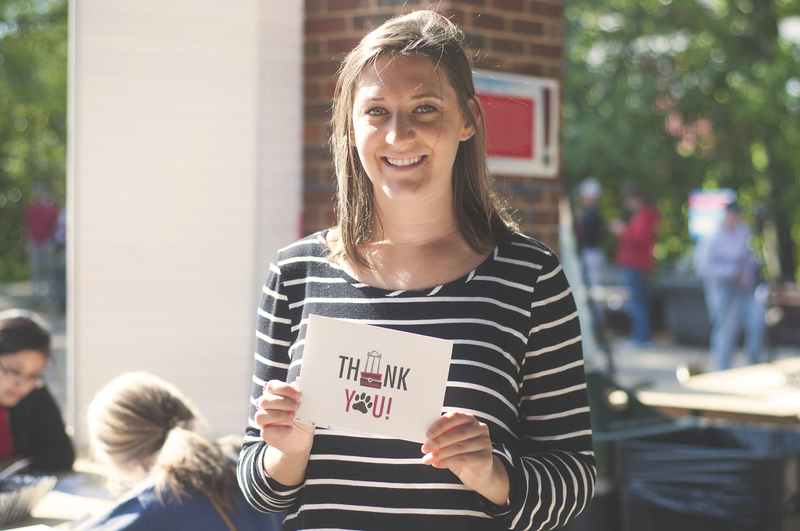 Last year, students from UGA schools and colleges on campus created more than 500 thank you notes and hundreds of video messages and photographs. Hundreds of students also signed the large thank you card. More than 200,000 current UGA alumni and donors received a video capturing the images and messages of gratitude from the day. The UGA Office of Donor Relations and Stewardship sustains and nurtures lifelong relationships with UGA donors through meaningful and consistent contact, which is accomplished through timely and appropriate gift acknowledgement, fund reporting, donor recognition, donor appreciation activities and events, and stewardship activities.